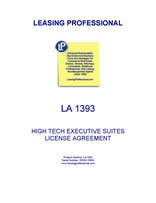 This Facility License Agreement (this “Agreement” or “License”) by and between Commercial Property Owner, a ____________ Limited Liability Company (“Owner”) and the individual or entity named in Section A below (“Client”) is effective as of __________ with respect to the license of the portion identified in Exhibit D hereto (the “Client Area”) of the High Tech Facility named in Section B.1 below (the “Facility”). Client will give ninety (90) days prior written notice to Owner if Client wants to cancel a renewal. Each party has read and understands the terms and conditions as outlined in Exhibit A (Facilities Service License General Terms and Conditions) and agrees to be bound by those terms and conditions. These terms and conditions apply to the License signed by Client. Under the License, Owner has agreed to provide Client with the Client Area identified in License Summary to the License and the base services described in EXHIBIT B to the License (the “Base Services”). The Base Services and charges for use of the Client Area are included in the monthly base service fees (the “Base Service Fees”) payable by Client to Owner. In addition, Owner provides Technology Services (as defined in Section 3(b)) and the other additional services described in the Additional Services and Technology Services – EXHIBIT C to the License (the “Additional Services” and together with the Base Services and the Technology Services, the “Services”). (a) Nature of Client’s Business. Clients will have the right to use the Client Area exclusively during the Term (as defined in Section 4(a)) of this Exhibit A. Client may use the Client Area only for office purposes connected to the business described in the License. Any use of the Client Area or the Facility of a “retail” nature, including retail sale of goods to the public or other Clients of the Facility, or any other use involving frequent visits by the public is strictly prohibited. Client will not engage in any business that competes, directly or indirectly, with Owner’s business of providing facilities, infrastructure and related services. (b) Client Equipment. Client will not install any furniture or office equipment, cabling, Internet or telecom connections without Owner’s prior written consent, which Owner may refuse in its absolute discretion. Owner has the right to have all such installations done by Owner’s designees at Client’s sole cost and expense. (c) Care of Client Area and Facility. Client is responsible and liable for any damage caused by its agents, employees, invitees, or persons permitted by Client in the Building, the Facility or the Client Area. Client agrees to take care of the Client Area, the Facility, the equipment, furnishings and other property that it uses and act at all times in a commercially responsible manner. Client may not alter any part of the Client Area, the Building, the Facility, equipment or furnishings provided by Owner to Client. (d) Client Name and Client Address. Client may use the address of the Facility as its business address. Client may conduct its business at the Facility only in the name(s) specified in Sections A.1 and A.2 of the License Summary. If Client desires to conduct its business under another name, it must submit a Name Change Form to Owner for approval, which will not be unreasonably withheld. Client may not post signs on the windows or doors of the Client Area or the Facility that are visible to those outside the Client Area. Owner will provide all signage for the Client Area. (e) Compliance with Laws. Client will not use the Client Area for any purpose that would cause a violation of the License or any applicable laws, rules or regulations or that in Owner’s sole discretion is dangerous, illegal, interferes with other Clients or impairs the quality, character, reputation or appearance of the Building, the Facility or the Client Area. (f) Facility Rules and Regulations. Client agrees to observe all rules and regulations that Owner imposes generally on Clients and users of its facilities. (g) Inventory. Client will sign an inventory list document when it moves into the Client Area (the “Inventory List”), which is attached hereto as Exhibit E and made a part hereof. The Inventory List will include all furniture, equipment and supplies in the Client Area and the condition of such items. The Inventory List will be updated as necessary to reflect additional items supplied by Owner to Client. (h) Hosting /Telephone Services. Client may not have any hardware or software in the Client Area or the Facility that is the unsolicited recipient/host of Internet traffic from outside the Facility. Client may not use any telephone services, telephone carriers or Internet provider in the Client Area other than those provided by Owner. (i) Surrender. Client will immediately leave the Client Area upon termination of the License. In the event that Client does not surrender the Client Area upon termination of the License, Owner reserves the right to charge Client two (2) times the Monthly Base Service Fee prorated for each day the Client remains in the Client Area following the End Date (as defined in Section 4). Owner may also refuse to provide any services during such period at no liability to Owner. If Client leaves behind any property, such property will be deemed abandoned and may be disposed of by Owner, including being discarded, at Client’s expense, and/or sold. If Client defaults under the License and Client is denied access to the Client Area, Owner will not be liable for any damages to the Client. (j) Keys and Security; User IDs and Passwords. Any keys or entry cards provided by Owner will remain Owner’s property at all times. Two sets of keys and entry cards shall be provided at no extra charge. Client will not make any copies of these keys and entry cards or allow anyone else to use them without Owner’s prior written consent. Any loss must be reported to Owner immediately. Client will pay the cost of replacement keys or cards and of changing locks. Client will use its reasonable efforts to keep the Building, the Facility, the Client Area and Client’s personal property safe and secure at all times.